I have a love affair with compost heaps, don’t laugh I’m serious. I’ve been known to wait at our local municipal dump on Saturday mornings in early spring with a high-side trailer and getting the locals to dump their spring clean-up matter into the trailer. This then goes home to start a few compost heaps for my summer requirements. The manufacture of compost is a task that can approximate alchemy if you so desire. There are so many complex formulas and combinations that many people fear the process of starting a heap. Unlike what many would have you believe, composting is not rocket science. It’s a simple, natural process that starts off by itself anyway. All you need to do is give it the best environment to do its work. 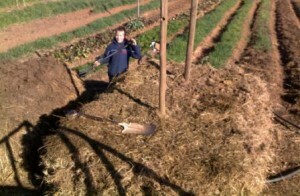 For me composting is a pleasure, mainly as I have found a foolproof method that works. This method is one that I picked up from the Jacksons of Wensleydale. Up until that point I just threw everything into a heap and once a year passed the heap through a sieve to filter out the larger chunks, which went pack into the heap. The sifted compost was added to my beds. This was a long process and did not yield the required amount of compost. Now we use the chimney stack method and I have found an increased production, shorter composting time, higher /faster breakdown and better quality compost. This method is without a doubt the best way to make compost and does not rely on specific mixes of ingredients like some people would tend to advocate. I have never built a heap that uses calculated amounts of anything, I don’t have the time, nor the inclination. Also, one never has the same ‘compost inputs’ available anyway, so each one has a slightly different composition. Trying to get the composition ‘right’ is just too finicky for me, we use what we have and have never had a flop. The worst that can go wrong with this method is that the heap wont heat-up. No worries there, just turn again and add some manure. Chicken is best, but cow, sheep, horse and pig will also do, basically in that order of preference. I personally try not to use horse manure as I find it too full of weed seed, but your experience may differ. We use 3 poles and a frame to lift the heap off the ground. Start with a base that is raised off the ground. 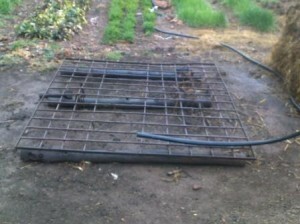 You can use branches, wooden pallets or basically anything that will allow air to gain access into the base of the heap. (I’m using an old metal frame resting on 3 wooden fence posts.) The initial layer should be made up of some coarse material. I prefer to use long veld grass or thin branch trimmings. The heap is then built in layers with whatever is available, lawn mower clippings, stable sweepings, pig and chicken sweepings, and generally anything left around that is organic. You can use you kitchen scraps (ours go to the pigs) just leave out fats and animal proteins. Basically a safe rule is this: If it once grew in the ground it’s safe to add to the compost heap. This includes, egg cartons, newspaper and natural fibers. Each layer must be thoroughly wetted as you build. Don’t try to wet the whole heap once it’s finished, as you will have dry spots that won’t break down, or slow down the process as they are not contributing heat. As you build your heap, have two or more fence posts (or similar) inserted so that you create two chimneys. Our heaps start out at about 1,6 m high and over a week or two they reduce in height as the insides start to break down and compact. You can check the heat of your heap by inserting your hand into the chimney hole and feel how the heat is doing. As the heap cools down you will need to start planning to turn it. Make a similar base or frame set-up and transfer the heap, top down onto the next platform. Using the same format of watering and again creating two chimneys to assist the aerobic breakdown to take place. 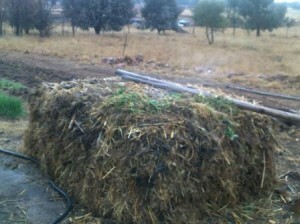 Once you have turned your heap 2 or 3 times the compost is ready. This can be seen by the composition of what’s left, if it has a dark brown or black look, smells earthy and is moist and crumbly it’s ready. Just take that as is and spread it over the top of your beds and let the little critters take it into the soil. We find that to outsides tend to be slower at breaking down than the insides, but that’s no issue. The outsides get transferred into the center at each turning and whatever has not broken down gets added to the next heap. The nice thing about this is that the new heap gets seeded with bacteria and other goggas from the old heap to help it on its way. No need to buy a compost starter. With this method of composting there is no risk of anaerobic decomposition taking place, there is no smell and best of all it just works. 2 days later, the pile is steaming at sunrise. We also find it beneficial to water the heap once a week from the top while it’s in the heating process, as the breakdown and heat escaping will draw a fair amount of moisture from you heap. That’s it for compost making. Enjoy. I want to plant winter greens, what do I need to put into the ground? I still have tomato plants but something is eating the leaves and they are yellow, some white stuff that is flying around them, it is a white little small gogga, what can I use to kill them. We also have had grapes and they also tackle them. Please help!! Look at feeding the soil with Vita Grow or Vita Green for a good winter crop I would look at around 100g per running meter of bed space. Your white gogga sounds like whitefly and can be resolved with a mix of Neudosan and Pyrol mixed at it’s lowest concentration into a single liter of water. Also have a look at our beneficial gogga’s that attack whitefly. different style of gardening. I grow all my own herbs and veges – which I mostly eat raw. My son Bruce has just been viviting from Saltspring Island, Vancouver, Canada. He bought me four old wine barrels and life has become exciting. I have always been an avid compost maker and have been reading all your comments with interest. I have a drum and a ompost heap but my big love is my little colony of red wrigglers. grief since 6 January so I do not know if this is even going on line. Hi Yvonne. Am in Joburg and would love to know where to get the bran and the recipe for bokasi please. Hi guys, quick question which might sound mightily silly but, when you say turn it, how exactly? Hi Qualien, what we do is set up another platform next to the existing compost heap and just transfer the pile from the top, down onto the new platform. Just remember to insert the poles/posts to create the chimney effect in the new pile. Excellent article on compost.I see my method was commented on.Just to say I turn it after 2 days ,then again 2 day later.after that i just turn it once a week until ready.The whole process takes three weeks not 12 weeks as per the comment earlier this year. Hi Fog, the poles are removed once the heap is built to allow air to move through the compost heap. If you are adding to an existing heap then just insert them again to continue the chimneys. you do not say if you keep the chimneys in place or remove the poles. is it just to create a void to let air out?